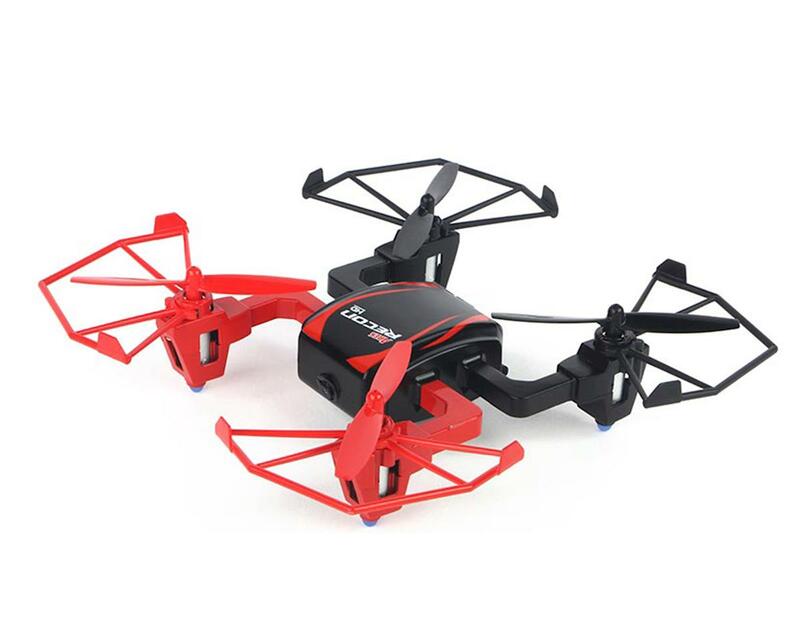 The Ares Recon HD RTF Mini Electric Quadcopter Drone is perfect for anyone who’s flown a mini-size camera-carrying quad. The importance of a machine that has a smooth control response, is gyro-stable in the hover, vibration free, and agile enough to hold position in a wind is critical. The Recon HD provides all these things, and a whole lot more. Equipped with a state-of-the-art, high definition, transmitter activated video and stills camera that records to an included 4GB micro memory card, you can really let your creativity run wild. What’s more, a USB card reader is also supplied so you can quickly and conveniently view, transfer or upload your video footage and digital images. Advanced features include a single button 360° flip function, bright LED lights on the underside (to aid orientation and make night flying a reality), and intelligent flight modes that allow you to switch from super-stable camera platform to fast and furious. The Recon HD comes 100% factory assembled with everything needed to fly included in the box. The Recon HD is a ready to fly quadcopter with built-in HD camera that allows you to shoot amazing video footage and still images — all controlled from the transmitter — and save to the supplied 4GB micro memory card. A high capacity rechargeable LiPo battery offers extended flight times so you can properly capture the action. It’s neatly stored inside the fuselage too, accessed for charging via a neat rear hatch. With 720p HD video and still image recording, gyro-stabilized flight and a silky-smooth control response you’ll be amazed at the image quality that awaits. Ready To Fly: The Ares Recon HD comes 100% factory assembled and includes a 2.4GHz transmitter with integral LCD, a 4GB micro memory card, USB card reader, 500mAh 1-cell 3.7V LiPo, USB charger, spare propellers and a screwdriver. All you need to complete is 4 ‘AA’ batteries for the transmitter. On-board Storage: Stored on the underside of the quad a 4GB micro memory card keeps that precious footage safe until you’re able to upload it using the included USB card reader. Indoor Friendly: Durable prop guards make the Recon HD perfect for smaller spaces, while ultra-bright front and rear LED lights mean there’s just as much fun to be had when the light is fading. Suitable for All: With a contrasting front / rear colour scheme, inherent strength and intelligent flight modes that allow you to switch from super-stable to fast and furious, the Recon HD is perfectly placed to satisfy both new and experienced quad pilots.